Don’t think we’ve done this before but it looks like everyone in the world this year has come up with a “best of” selection. So, here’s our tuppenceworth. A narcoleptic diary of hard times that shimmers with a beautiful heat haze. 3. Dan Stuart. The Deliverance of Marlowe Billings. Cadiz Music. A solid set of songs of the working man that packs a Southern punch. 9. The Illegitimate Sons. American Music. Independent. 10. Sacri Cuori. Rosario. Décor Records. Weird how things happen at times, synchronicity, chance etc. On Friday, the 21st December I was busy ignoring the end of the world message from the ancient Mayans while browsing in a record bin in a charity shop in the city centre eventually coming up for air with a fine find. A Martin Carthy album, Because It’s There, on Topic Records, score! Later that day (ahem, Mayans) this press release popped up regarding a plan to make the Topic Records catalogue available on line. For folk nuts this is big news. Details below. From January 2013, the venerable and redoubtable Topic Records (now 74 years old) will be making available another of its ‘gifts to the nation’, in the form of The Great Big Digital Archive Project. Thereafter, a programme of 6 – 10 additional titles will be released every month throughout the year. With the possible exception of Smithsonian Records in the US, this will probably constitute the largest digital project of its kind undertaken by an independent record company anywhere in the world. Topic has always had the underlying philosophy of making traditional based music as widely available as possible. The ambition of the label is now to make as much of its vast historical catalogue available using the current format – digital. What makes this project distinctive is that at the moment, digital delivery all too often divorces the audio recording from all artwork, documentation and sleeve-notes. The plan at Topic is to restore and include all of the information that accompanied the original releases of the past. In January 2013, 84 of these albums will be available to download complete with digital booklets. The digital booklets will be available from the Topic website as well as iTunes. There will also be a short YouTube film explaining the project in detail and the content of specific digital booklets. The first tranche of 84 digital releases will include albums originally released on vinyl LP in the late 1950s, the 60s, 70s and 80s. Many have been out of print for twenty years or more and include titles which were championed by John Peel and other influential broadcasters. Much of the repertoire on the field recordings included in the Topic archive has fed into the latest British folk revival, whilst many recordings of Irish traditional music are of cultural and political significance and date from a period when there were few domestic labels in Ireland releasing such music. The original recording of Davy Graham’s ‘Angi’ was made in Bill Leader’s Camden Town basement flat in 1962 and released on the seminal Topic 7″ vinyl EP – 3/4 AD. The vinyl release appeared in three different sleeves during the early 60s and with slightly different sleeve notes by Alexis Korner. Our digital booklet will incorporate all the sleeve notes and illustrate the variant sleeve designs. ‘Angi’ is widely regarded as one of the cornerstone compositions of the sixties’ acoustic guitar movement, famously recorded by Bert Jansch, Paul Simon, Ralph McTell, etc. Ms. Peters is a new name to Blabber’n’Smoke although she did get a fair amount of press around this time last year when she released The Christmas We Hoped For, a collection of Christmas songs as you might have guessed. A Texan and would be novelist she fell into the music scene when she took a gap year in Italy and stayed there teaming up with an Italian band, Ice Cream On Mondays. They split a few years back and Peters returned to Texas and recorded the Christmas album. One Kickstarter campaign later she has The Burn the Truth The Lies to offer us. With a very pleasing voice Peters delivers some jaunty sounding folky songs that disguise a sometimes bitter, careworn world. She’s at her best on No Decision where she condenses a sense of alienation and allies it with a wonderful band performance that shimmers like wet city streets reflecting neon. 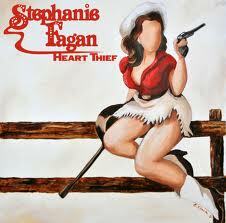 In contrast to the cerebral notions of Peters Stephanie Fagan initially appears to be a bit of a good time cowgirl going by the album cover. However, and as the man said you can’t judge a book by the cover. Fagan, from South Carolina, doesn’t let a whoop or a holler escape her lips here and actually shares some territory with Peters, singing songs about lost loves and regret on Heart Thief. She has a whispery and smoky voice and the first few songs are delivered with an airy acoustic guitar and mandolin to the fore giving the album the sense and feel of early Joni Mitchell. At times Fagan dips into a bluesy mood such as on Blow with its lonesome midnight trumpet but she does best on the songs that could have come from a cowgirl, however reserved. Prodigal is a Dobro driven gospel plow while You Are The Devil allows a clattering banjo to drive it along. A very promising effort. Blabber’n’Smoke first came across Rick Beerhorst just over a year ago when his album A Little piece of Pie cast a warm glow on some late winter nights. “Quirky,” we said at the time while admiring the literate vocal delivery and the naive art rock Sturm und Drang. At the time Beerhorst said that a band, Wealthy Orphans, grew out of that recording and one year later they’ve delivered their first baby. While it’s still essentially Beerhorst’s offspring the concentration of just four musicians (as opposed to the long list that populated Pie) allows for a more unified and uniform sound. Beerhorst (who writes all of the songs, sings and plays guitar and Victrola horn) is keen to note that the end result is a collaborative arrangement with his fellow band members (Michael Schaeffer, accordion, melodica, Adam Thompson, bass guitar, vibraphone, percussion and DJ Viernes, drums, percussion). A painter and printmaker as well as a community activist one gets the sense that Beerhorst has a fair degree of knowledge regarding theatre and in particular cabaret as several of Throwing Glory’s songs have a theatrical bent to them with a whiff of Brecht and Weill as well as contemporary artists such as The Tiger Lillies. The accordion affords a European feel and together with Beerhorst’s laid back vocal delivery it’s reminiscent at times of The Colorblind James Experience although Wealthy Orphans keep the polka element to a minimum. Broken Dreams and The Young Become The Old both swing and sway like a flea-bitten orchestra pit band from the Wiemar Republic while Dangerous Places is delivered as if it were by Nick Cave backed by a gypsy accordion band and is particularly impressive. Elsewhere Wealthy Orphans maintain Beerhorst’s love of New York art rock antecedents with Baby Who Have You Been With coming across like a European son of Talking Heads while Looking For My Muse is Antony & The Johnsons without the falsetto. A lovely song Looking For My Muse benefits from the fine playing of the band with some very sympathetic accordion and vibraphone and while they play well throughout the album they reach an apogee on Never Pass This Way Again where the plucking, picking and squeezing paints a wonderful backdrop that swells to a climax of Penguin Cafe Orchestra proportions. In the midst of this Beerhorst delivers his finest lyrics that recount a litany of failures and decay, an understated gem of a song. 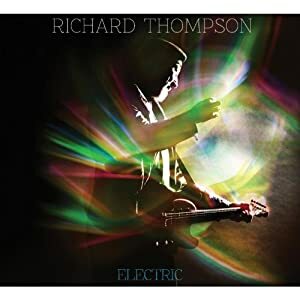 There are certain musicians who have accompanied Blabber’n’Smoke throughout the journey from adolescent to gray haired wisdom and Richard Thompson is one of them. From his days in Fairport Convention to the fabulous pairing with then wife Linda which produced classic albums I Want To See The Bright Lights Tonight and Shoot Out The Lights, followed by his lengthy solo career he’s always been one of our favourites. Perhaps the quintessential UK guitarist he’s been a beacon for an Anglicised rock and folk sound since the sixties so we were intrigued to hear that for his upcoming release, Electric, he’s teamed up with Buddy Miller, ace producer of numerous Americana icons. Miller produces and guests on the album include Alison Krauss who of course, with Miller and Robert Plant delivered the very fine Raising Sand album a few years back. Electric’s not released until next February but here’s a sneak preview of one of the songs, Good Things happen To Bad People. which will be released as a single. Can’t wait to hear the rest of the album. Thompson will be touring in support of the album release, no Glasgow date so far but he does play Edinburgh’s Usher hall on February 28th. Angie Palmer. Old Sticks To Scare a Bird. Lancashire’s Angie Palmer is one of the best kept UK singer/songwriter secrets. Despite the likes of Bob Harris championing her and a slew of fine releases she steadfastly remains just slightly under the radar. A pity really as she’s one of our most literate songwriters and capable of delivering songs that wouldn’t be out of place in Joni Mitchell’s oeuvre. For her latest album, Old sticks To Scare a Bird Palmer continues to offer some sublime Mitchell type sojourns with Postcard From Paris a lilting slice of reportage detailing a Paris morning while William Of The Desert is a desiccated dream poem that recalls Sandy Denny with some wonderful playing from her band. The album is sequenced as if it was a two sided vinyl affair with side two dedicated to Palmer’s delicate musings while the first half allows her to let her hair down and rock out a little. In reality this just means that the majority of the songs on side one are a little fuller, more fleshed out with instrumentation and strings. She does rock out on Dirty Little Secret which is a funky little blues rocker with guitarist Billy Buckley letting rip. Truth be told and despite it being a fine performance in its own right its almost akin to finding your parents making out on the sofa. You might admire their panache but it does upset the equilibrium. Little By Little is another up-tempo number but it flows much more smoothly with sparkling mandolin from Richard Curren and a driving rhythm that harks back to Mitchell’s Hejira. Time Of Thunder closes the first half and it’s a more successful amalgamation of the fire and earth that make up the album as Curran’s violin and Buckley’s guitar gimble and gyre like the venerable Fairport Convention back when Richard Thompson was a member. The rhythm section drive the song along as Palmer wallows again in the Denny stream. The most successful song on side one is Raising Hurricanes where Palmer tells a witchy tale of revenge that marries the traditional narrative of English folk song with a slinky Dobro driven southern states feel. Side two starts off with the straightforward Song Of Drowning Sailors, a traditional sounding folk tale. Aside from the aforementioned Postcard From Paris and William Of the Desert Palmer offers two sides of the story of a failed love in the two part Haunted By A Stranger, his tale is wintry while hers is brighter and optimistic. She closes with the wonderful Fresco which is breathtaking in its delivery with a tender guitar solo, almost like a singing saw, casting light on a perfectly sung oblique love song. The ghost of Sandy Denny and the spirit of Joni Mitchell hover around this but ultimately Palmer owns this sublime song as she sings gloriously throughout it. Tender, affecting and passionate this is an almost perfect song which deserves to be heard by one and all.